Requirements:Level 50+Signed into Snake Contract+Sacrificing A Snake. By Gaining this Energy Amplifier, The player is allowed to learn Snake Based Techniques and the Sacred Venom Element of The Snakes for Half of the AP. Must Pay at least 1 AP. True Form: Immortal White Snake Transformation (Passive) Avoids all Techniques while abandoning your body,Target one Square. User is shot to that location.While in Snake Form,the Player gains a new armor from the White Snake Scales.Regain 400 Life/Chakra/Stamina while ending any negative effects casted on the User. While in White Snake,User is only allowed to use Snake Based Techniques/Sacred Element and the Energy Amplifier Techniques,All User Techniques cost 50 Less Energy while poisoning 25 Life for three turns. Range 3. Once per battle. Immortal Poison (75 Chakra,passive) Adds INSERT POISON EFFECTS to a technique used or the Snake may use this technique as a regular move to spray a Target with Poison. Slither (75 Stamina per Technique) Avoids an technique from the last post. Scale Rejuvenation (125 Chakra,passive) Scales Regain 250 Life/Chakra/Stamina.Twice per battle. Reviving Reptile (0 Chakra,passive) The Player Revives with 400 Life,loses 100 life/Chakra/STamina every time revived,Must be the only revival technique used. Four Times per battle. Living Corpse Reincarnation(400 Chakra) User and Target are in a 1v1 Match.While Here, The User may begin Copying Techniques Excluding Energy Amplifiers. The Player may chose to Erase one part of the Target's Ability. The Target must Relearn those techniques.Can be Negated by a 3 Tier Sharingan. Inevitable,Becomes Obliteration if the Target has been affected Four times by Either Poison.Last for Two turns,Once per battle. Snake Scales: The Scales are alive and can attack on its own,allowed one Technique per turn. To Damage the Snake,One must destroy the scales first.Scales Stats=1300/900/900. All Techniques aimed at the Scales are reduced by 75. Unaffected by Genjutsu and Interrupts any Genjutsu aimed at the Snake. -Scale Shield (### Life) Guards Up to 3 Techniques for the Master,cost Half the amount of Life/Chakra/Stamina damage to use this technique,pick highest damage in the attack. -Shadow Scale White Snake Coil (100 Stamina) Holds opponent for two turns,cant be Dodged or Interrupted.Gains +1 Range if used after a Scale Attack. Range 2. -Venom Release:Paralyzing Burst (150 Chakra) Poisons 75 for Four Turns, Plagues. Cant Interrupt/Dodge/Block. Once every three turns. -Many Shadow Scale White Snakes (100 Stamina,100 chakra) 200 Life Damage,poisons 50 Life for Four Turns. Cant Interrupt,Guard or Dodge. -Evaporating Snake Fluid (Attribute) Insert Custom Poison. Item Drop:White Scales(200 Base Chakra) After Killing an Immortal Snake,the Killer/Any Passersby will receive and may successfully fuse the scales to their body. Players gain selected Bonuses.The Scales drop like a regular NPC Item. Resting Bonus (Static) Any Healing/Resting Items heal an additional 50 more. Resting Outside of Conflict takes 15 Minutes instead of 30. Part Snake- , The player is allowed to learn Snake Based Techniques for Half of the AP. Must Pay at least 1 AP. Shedding Rebirth(Static)The Immortal Snake revives on the battlefield from the Killer once the Killer's Chakra/Stamina is at 0;the Killer will lose the scales and die. Requires the Immortal Snake to have the Death Mask. Custom Poison: The Snake is allowed to create a poison that are used in many abilities of the Great Snake. May Choose Two Effects,Allowed to Stack. Poison 50 for three turns. Poison 25 for Six turns,Plagues. May Only Choose one Effect. Per every 150 Life Damage dealt to the Scales,Poison 10,Incurable poison. 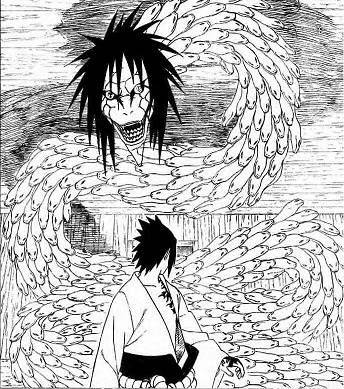 -When A Snake dies during its true form,it will lose any Techniques gained from Living Corpse Reincarnation. -Living Corpse Reincarnation :The Snake will have to Switch Bodies again within 30 Days,if not the Player dies . Insert Link/Date Switch/Date Expire. -If the Living Corpse Reincarnation Fails/Cancels after Hitting the Target, the Snake Dies.